It was 54° for this morning's walk of the dog; the running shorts and tank top I had on were hardly appropriate! I'm sure it will warm up throughout the day and I know we are (hopefully) still many weeks away from the real cold setting in, but I can't help think about the looming winter. This will be my third winter since I moved back to New York and I am no more excited than I was for the other two. Maintaining my training is made exponentially harder by the cold temperatures and short days. Waking up at 5:00am is hard enough when it's nice out but sometimes your body just says "no" when it's cold. Weather aside, I'm working on developing a plan/strategy for the winter that will further fortify my foundation for when Mont Tremblant training formally begins in late February. I am committed to working on my weakest link: swimming (specifically my form). I also plan to focus on increasing my cycling power. To accomplish these two goals I'm considering both joining a Masters swim group (though I'm no aquatic Master myself) and trying the Sufferfest indoor cycling DVDs which I've heard great things about. For now I'll just enjoy the remainder of summer and the cooler temps of fall. Though the weather may soon put the kibosh on swimming and cycling, this time of year helps produce some of the best run results (see: Marathon Performance and Temperature). I am signed up for next week's Cow Harbor 10K and plan to round out my season with a few more running races. I've yet to run a standalone 10K nor have I raced a 5K with an actual goal; this fall - in a 5K yet to be chosen - I will be aiming to run sub 20 minutes (a far cry from my first 30+ minute 5K several years ago. Early attempts to properly plan my 2013 race calendar went a bit by the wayside after some of the winter’s events. 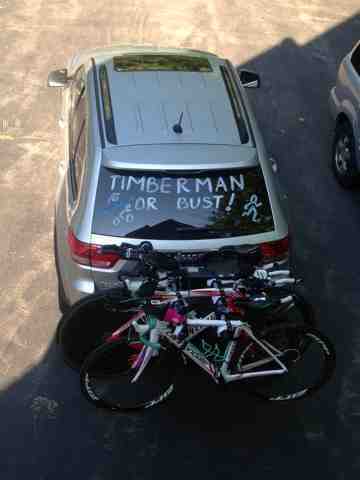 My hope to race an Olympic-distance event about a month before Timberman was saved by the New Jersey State Triathlon. Despite being sold out, an email to the race director secured spots for me and my buddy (J$). Located in West Windsor, NJ at Mercer County Park, about 40 minutes from my Aunt and Uncle’s house, the race was close to home (yet far enough to offer a mini-simulation of traveling for race). We headed to NJ on Saturday for packet pickup and enjoyed a pasta dinner with my Uncle before laying down for an early night’s rest. Race morning entailed an early (even more so than on a normal race day) wake up and breakfast before the 40-minute drive to the race site. We were among the early arrivals (as is tradition for J$) and had plenty of time before the race would begin. Today's post is brought to you by Barry, this morning's sad excuse for a spin instructor. 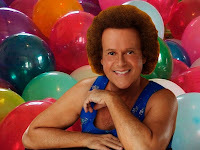 For visual purposes imagine the following: a 60-ish year old man wearing very short women's-styled bicycle shorts (note as you form your mental image that I didn't say cycling shorts), rocking a Richard Simmons-esque yet much more flacid perm, and a cut-off shirt, all coupled with a deep baritone voice (think Rocky meets Barry White: "Yo Adrian, can't get enough of your love). I'm a member of LA Fitness and have been for over seven years. My relationship with LA is love and hate, but mostly hate. I love my membership fees; for what I pay it is incredible to have access to so many facilities most of which have a swimming pool. I also have access to all their fitness classes which provides me with spin classes to supplement my riding (and replace it in the winter). Hmm...anything else? Nope, I'm out of positives. On the contrary, it seems LA cares about one thing, and one thing only: getting members signed up. The care, or lack thereof, that they put into maintaining their facilities is lackadaisical at best and more like negligent. You want examples? You got it: despite being among the earliest crew at the gym (pre 6am on many days) the garbages are consistently stuffed and overflowing, several weeks ago a smoke detector began sounding its low battery alerts yet it still continues to cry for help, shower curtains are moldy beyond even the lowest sanitary standards, but I will stop there. As far as classes and instructors go, LA is totally hit or miss. There are some great instructors, along with some horrific ones. Dealing with these issues (petty though they may seem) and the myriad others is the price I pay for not paying much at all. Back to the task at hand though. What made this morning's class so epically bad that I felt compelled to write about it? Rather than describe the class I think I will sum it up in the following list of what not to do and what to do in order to be a terrible instructor. Keep in mind this is Barry-inspired and not Barry-specific. Don't: by any means, introduce yourself. 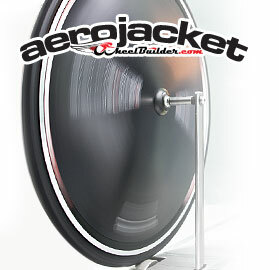 Do: completely stop pedaling and close your eyes (this is particularly motivating to the class). Don't: ask if anyone needs help with their bike setup. Do: tell people precisely what gear to be in despite their inherent differences in size, power, and fitness. Don't: give people any idea of what's coming next; instead just randomly yell "jumps" or "climb." Do: speak softly so that no one can understand you. Don't: tell someone when their seat is so low that they are at risk of injury. 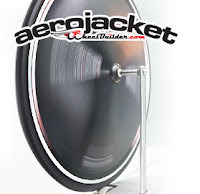 Do: tell people to spin as fast as they can (bonus points pushing them to go above 120RPMs or higher than the bike can even calculate). Just to put this all in perspective, I get that not all spin instructors (or participants) are cyclists, nor do they need to be. I think, however, that they have a responsibility to run a class that motivates participants and guides them through a class that is both safe and will promote fitness gains. In order to do this some level of understanding about resistance, cadence, power, and heart rate is necessary. It's not too difficult to spot the good vs. the bad classes, just take a peek in the window. Aside from typically being pretty packed (the really good classes sometimes run out of bikes), another sign of a solid instructor is a class in sync. This shows that the instructor is leading the way; this morning was the opposite. Barry was lost adrift in his own sea of weirdness leaving us to find our own way (only to be reprimanded when I quietly called out our own intervals). I've toyed with the idea of becoming a cycling instructor myself and it is still on my to-do list. I don't think it will be easy by any means but I think that right now I can run a better class than half the folks teaching at LA Fitness. And, if I put in the time and effort, I think I can be a damned good instructor. For now though, I'll have to settle for what they've got and keep building the list of the good and the bad and scheduling accordingly.